Home / Sharpening Articles / Sharpening FAQs / How do I sharpen a curved knife? 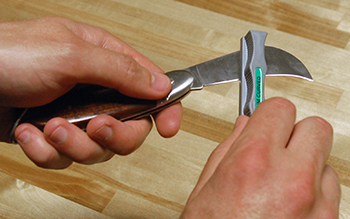 Sharpening a curved knife is just as easy as a straight blade. However, the products used are slightly different. A traditional straight blade (or one with a outward curve) is sharpened on a flat stone. However, a curved knife such as a hawkbill, kukri or karambit with in inward curve must be sharpened with a round edged stone. The actual act of sharpening, as well as the angles, are typically the same. The only difference is that a round edge stone is important so it can contact the blade properly. Some knifes have a very gentle inward curve near the heel of the knife. This portion of the knife is best sharpened with a round edge stone as well. We have a page dedicated to products for sharpening curved knives. How Do I Know If My Knife or Tool is Sharp? Questions on sharpening a knife of a different shape?